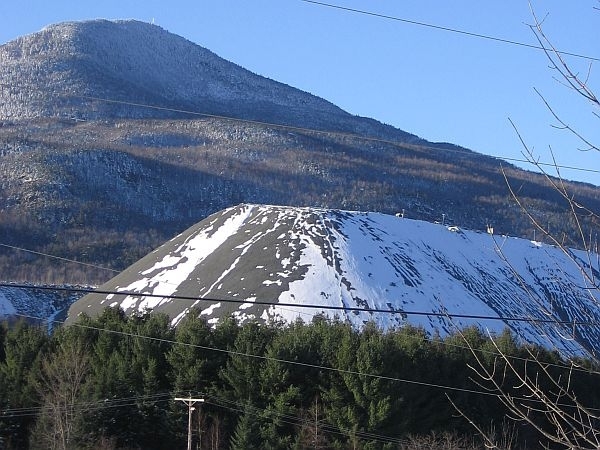 (Host) Two Northeast Kingdom towns will vote next month on whether to have an abandoned asbestos mine declared a Superfund hazardous waste site. The state argues that the Superfund listing could bring in federal money to clean up the site. But as VPR’s John Dillon reports, residents worry about the impact on their property values. (Dillon) State environmental officials stood before a skeptical crowd in Eden this week and tried to make the case that the government was there to help. George Desch heads the state’s hazardous waste program. (Desch) "We think the site should be a Superfund site because it’s massive, because of the scope of it, because we think ultimately it’s the only way we get the resources that are necessary to clean up the site. We’ve made this pitch before; I’m not going to bore you with that." (Dillon) The asbestos mine on Belvedere Mountain shut down almost 20 years ago. But its legacy lives on in the form of huge piles of asbestos waste. The federal Environmental Protection Agency says the fibers could be hazardous if they’re inhaled. Environmental scientists also worry that the asbestos waste is polluting nearby streams and wetlands. Cleaning up the site in Eden and nearby Lowell could cost up to $200 million. A private developer says he could use the site -once it’s cleaned up – for a biomass plant. But judging from the reaction in Eden, there’s not much support for either idea. (Wright) "Forgive me if I don’t go along with the program, but it ain’t all that ugly." (Dillon) Peter Wright says he’s lived near the mine his whole life and isn’t worried about the waste piles. (Wright) "As far as I’m concerned you folks can just leave the mine alone. We don’t need your biomass plant. It isn’t going to do anything for us. It’s at best 20 years down the road. I won’t live to see it. All you’re going to do is destroy the property values that exist if we do anything. I would suggest that the government get the hell our of our business. Take the EPA and go home." (Dillon) Resident Dennis Liddy had the same concerns. (Liddy) "What’s that going to do to the property values when we go to sell our property? What happens in a Superfund site? Are we going to able to sell their homes for more than fair market value or at least at fair market value?" (Dillon) State environmental official John Schmeltzer said he’s tried to research that question. (Schmeltzer) "It depends on the site. I think in a lot of places it’s not the Superfund, the naming of the site as a Superfund, that’s causing the issue. It’s the fact that you have an unresolved issue with a contaminant source." (Dillon) Schmeltzer and other officials said the state would not pursue the Superfund designation if the towns reject the idea at Town Meeting.